For a lot of years, Los Angeles and South Florida held the joint monopoly on summer clothes in the winter. And then Miami dropped. All those people who migrate south in the winter were mighty disappointed with the extreme temperatures of Florida’s bitter 60 degree weather. God forbid, you might have to wear a sweater and pants. My father called me from “Boca” (that’s what they call it there). In Boca Raton, where every retired New Yorker goes to play golf, they were hibernating inside. I felt very smug because here In Los Angeles it was 80 degrees and everyone was wearing shorts! I wanted rain. I really wanted rain! And then the rain came… and came and came. And I started to think, maybe this is a good thing for us Angelinos and not just because we need the water conservation. Winter is a great time for reflection and contemplation. If you turn inward and just sit with yourself for awhile, the imagination can begin to marinate. The best soups I’ve ever made were their tastiest after being frozen for weeks and then defrosted and heated. But just like a great soup, if there isn’t time for it to just let all the ingredients of your psyche come into some kind of relationship in your subconscious, what gets produced is not rich or deep in flavor. Something else I think is great about all this rain and cold weather is that it is bringing up people’s real emotions. When the sun is shining, it is easy to displace your fears and anxieties on a good game of tennis or golf, for example. I created a seven-stage model for helping people overcome the fear of change and it came to me in the dead of winter. Yes, I’m excited about all this rain. I have a strong sense that late April is going to bring a Spring full of possibilities. In the mean time, jot all your inspirations onto paper or even a blog perhaps. And then in Spring, and not until Spring, see if there is a connection between the ideas. You may have a whole new career waiting for you. I teach people to get outside their boxes and risk. 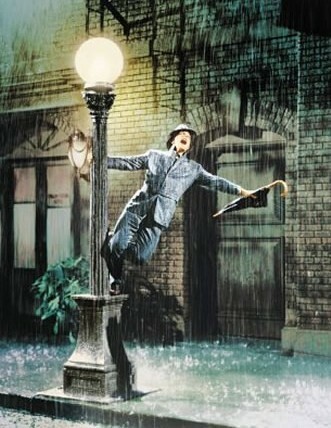 So here’s one – in the spirit of Gene Kelly, go outside and sing in the rain. It can do wonders for your creativity! Dr. Toni Galardi’s new book The LifeQuake Phenomenon is now available to be ordered. Coach, Consultant, Psychotherapist? Or simply Change Agent? © 2019 Dr. Toni Galardi, All Rights Reserved.